Minette is 6 years old. She is a Tabby. Minette was given to us 3 years ago when the previous owners couldn't keep her anymore. Minette is declawed and will bite when she's aggravated, which is what happened when a 2 year old pulled her tail. Our house is quiet and without small children. She is totally content here and we love her. No matter where we are or what we're doing, Minette is with us and doesn't like being left on her own unless she's having a nap. Our bed is her favorite place. Trying to read a book or work on the computer when Minette is around is challenging because she wants to be right there too. She makes me laugh. 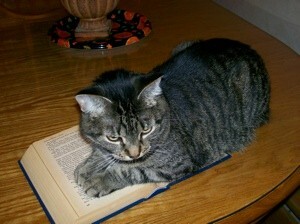 Here's a photo of her when I was trying to read my book the other day.